Sgt Pepper’s at 50 – the greatest thing you ever heard or just another album? The Beatles’ Sgt Pepper’s Lonely Hearts Club Band turns 50 on June 1 and the anniversary of this legendary album will be celebrated in style. But has this classic work – named the greatest album of all time by Rolling Stone – stood the test of time? We asked six writers for their perspectives. While the cultural impact of Sgt Pepper’s Lonely Hearts Club Band is hard to ignore, “greatest of all time” debates have the potential to obfuscate as much as clarify. White noise over Sgt Pepper’s place in some kind of dubious canon distracts us from its musical qualities, and its well-documented radical experimentation can be over-hyped in the melee. Thankfully, there’s more to the album than novelty and mythology. Sgt Pepper’s outsized reputation stems partly from the sense that it paved the way for rock and pop’s subsequent expansion into more “lofty” realms of artistic expression. The album captured the world’s imagination thanks to its central conceit (the band’s alter ego that in truth only relates to the first two songs plus a reprise near the end), the creativity and variety of its psychedelic song-writing, production techniques and striking cover art, and its bold forays into territory such as avant-garde aleatoricism and Hindustani classical music. Yet for an album considered so forward-looking, it drew heavily on its time, place and even past. Frequently (and somewhat misleadingly) labelled the first “concept album”, Sgt Pepper’s was not so much a trailblazing bolt from the blue as a direct response to the Beach Boys’ brilliant Pet Sounds (1966) – itself inspired by the Beatles’ Rubber Soul, (1965). While the album’s palpable drug-haze augured the “Summer of Love”, the Edwardian flavour of the eponymous military/variety band thread could hardly be more disjunct with the times (at least on the surface). Both When I’m Sixty-Four and She’s Leaving Home are imbued with affection and empathy for older generations, a decided break from the norm in 1960s rock and pop. Perhaps due to the combination of such idiosyncrasies with genuine experimentalism, the idea prevails that Sgt Pepper’s value lies in a perceived contribution to advancing musical “progress”. Some critics detect pretension and a kind of clinically manufactured zaniness to the whole project. So it’s worth examining at least one track – the very last one, A Day in the Life – to find something from the world of emotion in Sgt Pepper. Famously a hybrid of two separate song ideas – the melancholic opening coming from John Lennon, the middle section from Paul McCartney – the song is widely considered the album’s best. Its epic feel arises from the juxtaposition of contrasting mood and tempo, along with the experimental “end of the world” orchestral crescendos and the ten-hand/four-keyboard power chord that closes the album. While inventive within the context of commercial music at the time, these novel elements alone fail to explain our constant returning to the song. It could equally be subtleties such as the way Lennon’s poignant lyrics, drawn from a newspaper, manage to evoke the universal through the particular. It could be the opening melody circling through a major-minor progression (bright to pensive), the sadder harmonies corresponding to wilting lyrics such as “I read the news today, oh boy”, or the way Ringo Starr’s sensitive drum fills seem as much concerned with gently reflecting the text as laying down a beat. For this listener, these countless details of songcraft put Sgt Pepper’s into a category of music that never gets old, tired or boring – ultimately, the most likely reason for its longevity. Can we please move on? Sgt Pepper’s is a very good album. I like it; most people like it. It was undeniably innovative, and helped to change the idea of what a rock album could do. That said, the way this album, and this band, along with a small group of their (white, male) peers from the same era, have come to dominate the rock canon and discussions of what constitutes good music needs to be challenged. The famous Sgt Pepper’s album cover. The constant refrain that this is the best that popular music has to offer not only erases the African influences that led to The Beatles in the first place, but serves to devalue everything that has come since. The fact that we return so often to this band, and this era, also means there is so much less space for the music of today’s youth. It is often said these days that rock is dead, or at least dying, and our increasing tendency to look backwards musically, and to fetishise the past, is part of what has brought this about. The initial spirit of rock and roll was supposed to be about rebellion, change, and a celebration of not doing things the way they had always been done. But the deification of The Beatles is the opposite of this. No band could possibly be as good as the myth of The Beatles has made them out to be. It’s time to find some other music to talk about. Fifty years since the release of Sgt Pepper’s, The Beatles continue to attract new fans. Though their role as contemporary symbols of youth culture has long since passed, one of the band’s most significant legacies is how their music, style, and sensibilities continue to encapsulate the verities and complexities of “being young”. It is this album that showcases that legacy most eloquently. Though Sgt Pepper’s reflects the ethos of 1967, the reveries of youth spring eternal through its songs. Young people’s search for both belonging and independence sound out in With a Little Help From My Friends and She’s Leaving Home. The psychedelia of Lucy in the Sky with Diamonds and A Day in the Life mirror the fearlessness of youthful adventure and risk-taking. Questions of identity and life’s meaning (present and future tense) are expressed in the wildly different Within You Without You and When I’m Sixty-Four. And just as Getting Better speaks to the optimism of youth, Good Morning Good Morning depicts the presumed dullness of adult life. Trailer for the 2007 film Across the Universe, which is built around Beatles’ songs. These ideals and imaginings are embedded in a diverse soundscape that encompasses the carnivalesque and the sober; the flirtatious and fantastical. The inclusion of flanged vocals and notes that seem to echo forever demonstrates this experimentation best. Such sonic explorations created “young sounds” that endure. As a Gen-X Beatles fan, this was the first of their LPs that I heard and it remains one of my favourites. As a youth culture scholar, it is clear to me that this album speaks a language that translates across the generations. So whether 17 or 70, today’s Beatles enthusiasts are all part of Sgt Pepper’s band. 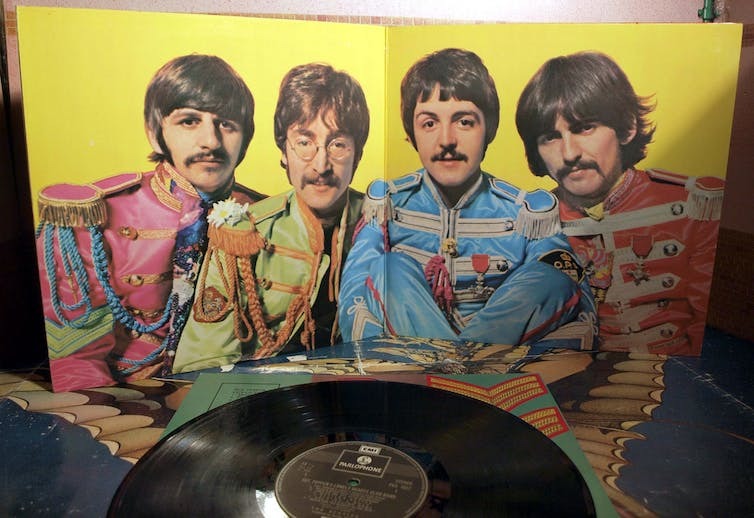 Sgt Pepper’s 1967 release represented, as music scholar Martin Cloonan notes, “pop’s slow climb out of a cultural ghetto”. This explosion of musical colour was significant in foregrounding the album as a statement of artistic intent. The creative strides that the Beatles made were an apogee of a larger shift that also saw musicians making use of the studio as a creative tool, not just a place to set down their songs. Sgt Pepper is, however, also an important illustration of a wider cultural and political context. Changes in education saw the rising influence of art schools, with popular musicians conceiving of what they did as more than just entertainment. As post-war austerity (and national service) receded, the “Summer of Love” also aligned with the ascendancy of a more open, political culture and came amid Harold Wilson’s socially reforming government. 1967 saw the decriminalisation of homosexuality, the legalisation of abortion following on from 1965’s abolition of the death penalty and Wilson’s attempt to take Britain into the European Economic Community. Sgt Pepper’s success was in hooking this forward-looking attitude to a sense of the past. The mysticism of Within You Without You and overt psychedelia of Lucy in the Sky with Diamonds sat alongside echoes of music hall and cross-generationally accessible songs such as When I’m Sixty Four. Its experimentalism pushed forward pop’s boundaries but simultaneously spoke to a country that was shaking off the dustier aspects of a more deferential and restrictive post-war culture. Whatever wind was blowing at the time moved the Beatles too. I’m not saying we weren’t the flags on the top of the ship. But the whole boat was moving. In December last year, I purchased a record player for my wife as a birthday present. It had been two decades since I owned one. Buying vinyl is a very different experience from CD: the art counts. It’s the classic listening experience of this format that contrasts with CDs, playlists and even streaming services, which now invite songs to be skipped and shuffled out of their original order. The key to vinyl is that we listen to the album the way the artist intends: the order matters to the musical and lyrical story that unfolds. This was certainly the case when The Beatles released Sgt Peppers. What makes a concept album is a larger meaning that unifies the order and themes of the music. The collection is more than simply a range of individual tracks. Concept albums became a scarce commodity as vinyl sales all but evaporated with the rise of digital. But with vinyl’s recent resurgence, we are reminded that music can still be presented as an immersive story. In Sgt Pepper’s, The Beatles take us on this rather experimental journey – perhaps more so because it was never meant to be toured. (The band actually planned to stop at the conclusion of their final August 1966 US tour after tensions were mounting). The reprisal of its title track towards the album’s close (known as bookending), and the thematic “military band” alter egos walk us through the album’s various stages. Listening to it, you can sense the specificity of the concept they imagined. Now, 50 years on, it is no less powerful. 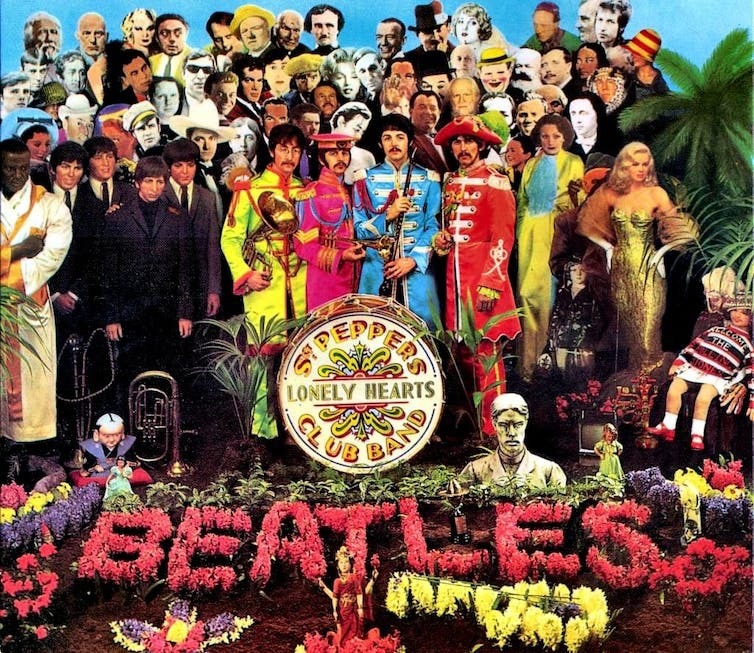 If Sgt Pepper’s towers over the landscape of modern music, it’s not as the pinnacle of pop. It’s for predicting progressive rock: that loose genre praised and derided in equal measure for its musical, lyrical and, importantly, visual concept albums. Its lush arrangements and overwrought production, along with its celebrated album art, pointed the way to the sights and sounds of the Moody Blues, Yes and Genesis. But Sgt Pepper’s concept is thin and was actually contrived after recording commenced. Its elusive Edwardian threads connect only the title track and its reprise to the vivid circus imagery of Being For The Benefit Of Mr Kite! and the fusty When I’m Sixty-Four, but are woven large by designers Sir Peter Blake and Jann Haworths and donned by the band on its cover. The vinyl and album art for Sgt. Pepper’s. The sleeve’s gatefold cover with lyrics was an immersive canvas that invited train-spottery. In matching visual detail to multi-layered sounds, the concept of connecting audio to art soon became de rigueur. The big bands of the 70s were especially monogamous with their preferred designers: Pink Floyd had Hipgnosis; Yes had Roger Dean. However, the sleeve-as-canvas was mortally wounded by the introduction of the CD in 1982. The rise of the immaterial MP3 then delivered the fatal blow. Sgt Pepper’s visual imagery has not survived these ravages well. Rather, Pink Floyd’s Dark Side of the Moon – which owes a massive audio engineering debt to The Beatles – bears a comparatively simple sleeve that predicted the nexus of shrunken packaging and time poverty. 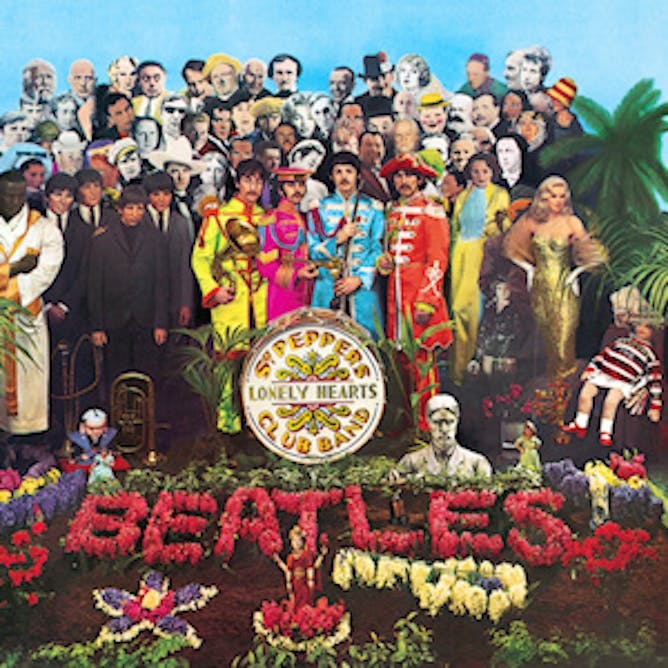 Sgt Pepper’s cover was nostalgic in its own day, but it’s merely obscure and arcane now. The Beatles will celebrate the 50th anniversary of Sgt Pepper’s Lonely Hearts Club Band with several reissue packages on May 26th.